Paul Crook has over 20 years experience dancing and teaching authentic 20s – 50s swing dance. Let his expert feet guide you through 2 and a half hours of Lindy hop, Balboa, Charleston and Swing Dance. Able to teach all levels of dancers, with beginners between 7:30-8:30 and intermidiates between 9:00-10:00 – there really is something for everyone! If you need even more convincing, the first class you attend is Free, with every class after that only £5 per person. 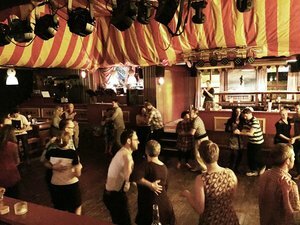 The classes are in out little big top room so no need to book – just drop in and start tapping those toes!